Prints of Dublin as it would have looked in the late 18th century starred in an interiors sale held in the same modern-day city at Adam’s (20% buyer’s premium). 'Barracks. July 1793' from a set of 25 hand-coloured aquatints of Dublin by James Malton (1761-1803) – €13,000 (£11,000) at Adam’s. The set of 25 hand-coloured aquatints were made by James Malton (1761-1803) and formed his seminal work Picturesque and Descriptive View of the City of Dublin. 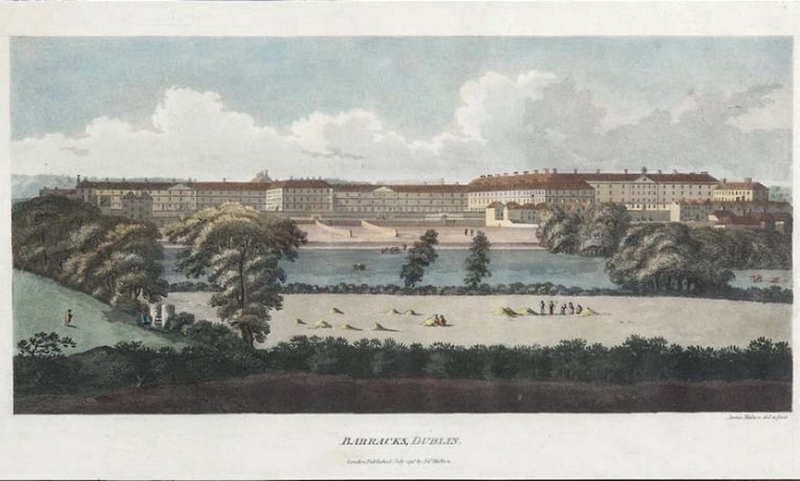 Originally published between 1792-97, the prints accurately depict the architecture of Dublin as it underwent an architectural metamorphosis during the 18th century. The plates were executed in etching and aquatint by Malton himself, and accompanied with a descriptive text, dedication and a vignette in aquatint. It was also published in a bound volume. Sought-after and scarce today, this group bettered the €8000-10,000 guide to sell for €13,000 (£11,000).